I’m the first born to a southern father and mother from Memphis, Tennessee, and proud auntie to several nephews and nieces, thanks to my younger boy and girl twin siblings. 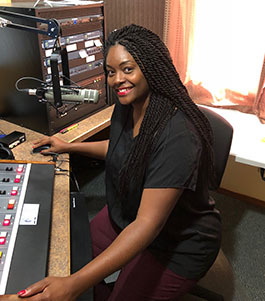 I completed a BA degree in Broadcast Performance for Radio and Television, at the University of Tennessee at Martin, and yearly exchange in the Edward R. Murrow College of Communication at Washington State University. During college, God afforded me the opportunity to become a reigning pageant queen, as the former Miss Black Tennessee USA, where I spoke on the platform against domestic violence. I presented “Queen Builder” panel discussions on college campuses, churches, shelters, and high schools, where I was able to spread the awareness of healthy relationships with ourselves, others, and more importantly, God. After Graduation, I worked in TV news production for West Tennessee. I soon received an opportunity to be of service to mankind, where God helped me to reach our suffering youth to know Christ Jesus for themselves. I spent four-years as a Teen Mentor at a trauma-treatment facility for behavioral/psychiatric adolescents. Thereafter, God brought me to Kinship Christian Radio, to help spread the Gospel message of Jesus Christ! The most prized achievement was choosing to follow Christ! I am reminded of his grace and mercy daily. He is so patient and kind to me, and I can’t thank him enough, for what he’s done for my family and myself. I am so thankful for the opportunity to serve God, through any means he chooses. You can reach out to me anytime at gabbyl@newmail.kinshipradio.org!